Saturday January 16th 1892 weather more pleasant. I was busy about my work all forenoon. Will took me to town after dinner in the sleigh. I did not find the girls at home and went up to Mrs Moores for a call. After supper I went back to Hatties to spend the evening. Sunday January 17th 1892 It snowed all day long. Will went over to Woolfs in the afternoon. We had turkey for dinner and Edith and Robbie were over to dinner. I put in all my spare time in reading. I had a letter from Charlie. Monday January 18th 1892 It was a cold day. I was busy all forenoon with the house work. The girls came in the afternoon just as I was ready to got to town. Will took them home about four oclock and made another trip for Edith who had walked over after they did. I did a little knitting. Will walked out to Woolfs in the evening to get Mr Woolf help him deliver his hogs in the morning which he sold for $4.00 per hundred weight. Tuesday January 19th 1892 It was the coldest morning of the season more that 20 degrees below zero. Will got his hogs all right. they brought him $384.00. In the afternoon we went to town in the sleigh. I am knitting for Will. 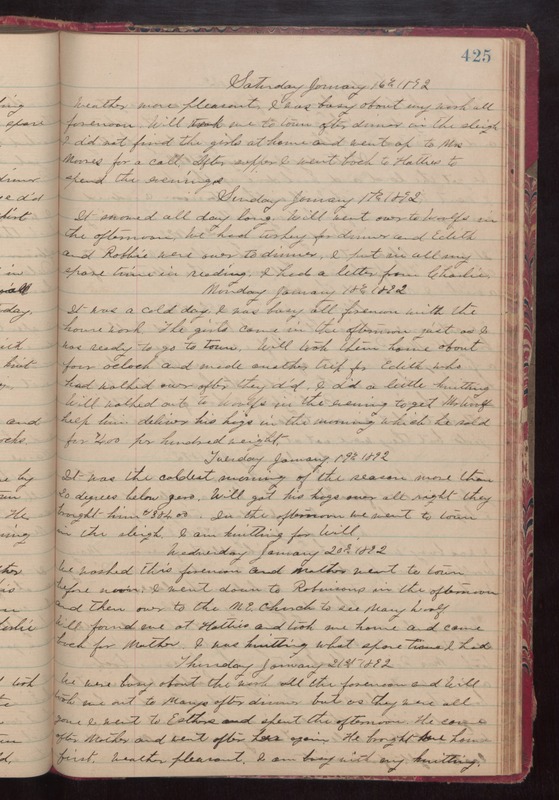 Wednesday January 20th 1892 We washed this forenoon and Mother went to town before noon. I went to Robinsons in the afternoon and then over to the M. E. Church to see Mary Woolf. Will found me at Hatties and took me home and came back for Mother. I was knitting what spare time I had. Thursday January 21st 1892 We were busy about the work all the forenoon and Will took me out to Marys after dinner but as they were all gone I went to Esthers and spend the afternoon. he came after Mother and went after her again. He brought me home first. weather pleasant. I am busy with my knitting.